Brooksville Country Club offers a State of the Art Fitness Center designed to meet all of your health and fitness needs. Outdoors you can enjoy the relaxing atmosphere poolside with friends and family or perhaps a challenging game of tennis. Our gym provides all the equipment necessary for a productive workout while watching your favorite television program on our flat-screen TVs. The Fitness Center also offers a variety of fitness classes suitable for a range of fitness levels and interests as well as personal training all taught by certified professionals. Our sauna and hydro-therapy bed are great additions to our facility. Whether your goal is to live a more active lifestyle or de-stress at the end of the day, our professionally staffed center is available to serve you. Our beautifully maintained in-ground swimming pool is located at the back of our fitness center. 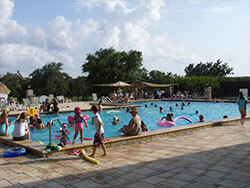 We have plenty of poolside furniture, and the pool area is available for parties and cookouts. The pool is a Junior Olympic pool size which means it is 50 meters long and can be used for training and swimming laps. Contact the Business Office (352)796-8236 ext. 102 for more information.